One morning back in November, Johnny nudged me and said, "You know, your website needs some love. You haven't posted since August." And my thought was, what?! How is it November? And now here we are at the end of January and I have a zillion half written entries, abandoned because they felt trivial or because another big thing came along and sidetracked me. Since August, I have been through some of the toughest days of my life and since August I have also been through some of the best, most delicious, most wonderfully precious days too. So here are some highlights. Before the end of the first week at Bee's new school, we learned that kindergarten is indeed a transformative year. Last year in her neighborhood nursery school we dropped her off at 9 and picked her up at 1. She had naps and playdates and snacks and juice boxes. She was a baby. Now our little Bee gets the school bus at 7:20 every morning at a stop over a mile from our apartment and the bus drops her back off at that same spot at 4:20 in the afternoon, meaning we leave the house with her before 7 am and she returns -- on days she doesn't have anything after school -- after 4:30. At five years old, she works longer days than most adults I know. What's more, she has homework every night that involves reading, writing, math, drawing and more. This is so exhausting and she is so tired that she's ready for bed at 6:45. And because I've only barely walked in the door from work by then, that means she's up at 5:30 am doing homework and getting ready for school and I'm up with her so I can spend some time with her. So nowadays our entire family of spooky night owls is in bed before 10. When did we all get so old? Bee is tall now, and more slender. She has long hair with a black streak and she wears hoop earrings. Some days, she's very concerned about her appearance but other days she prefers that I pick her clothes for her. She's still into her Twinkle Toes and all things glittery and sparkly. 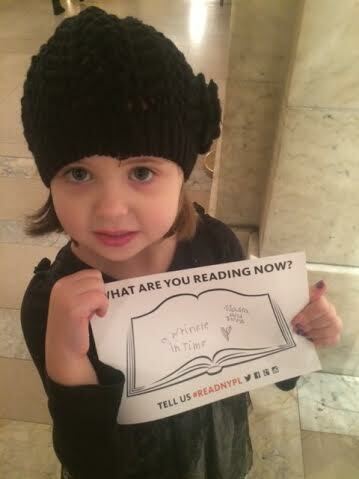 She's into magic: everything from the Rainbow Magic books to Harry Potter. She would wear makeup every day if I let her. She is reading now -- slowly and rather reluctantly, if I'm honest, because she would much rather be read to -- and writing. She is showing a real talent for drawing and art. The girls are sometimes mean and petty, so she has had to work through a lot of interpersonal issues already. And I am proud of her for holding her own. 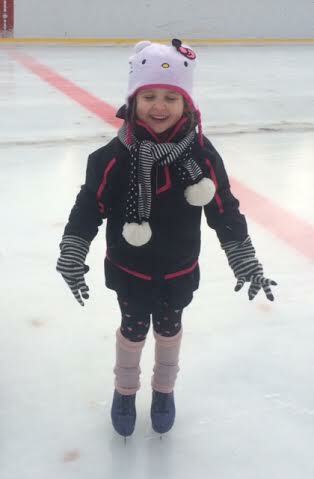 She learned to ice skate, started riding a big girl bike (20", no training wheels) and my personal favorite, she is becoming marginally less picky an eater. In the fall she swam and was part of a weekly group that explored Central Park; this spring she'll be doing Glee Club and soccer after school. But the real change is that she's thinking for herself. In one project, the children wrote their own book and hers was about when she got her cats. For MLK day, her dream was envisioning a world where everyone was vegan and no one hurt animals. For her first research project, she had to select an agent of change. I pushed for Bowie; she chose Henry Bergh (the founder of the ASPCA). Even though they fight a lot, she usually takes good care of her sister. And I am so proud of her. Teeny also went back to school, this time in the integrated classroom. This was absolutely the right move for her. Her speech is very clear now and she is imaginative and expressive. She understands what it means that we are vegan and we don't eat animals. She cares for her babies, cooks in her kitchen, loves mermaids and Bubble Guppies. She always wants me to be the baby and her to be the mama. She strokes my hair and tells me to go to sleep in her bed, she makes me sit in a chair that serves as the backseat of the car so she can drive me to Nana's house. 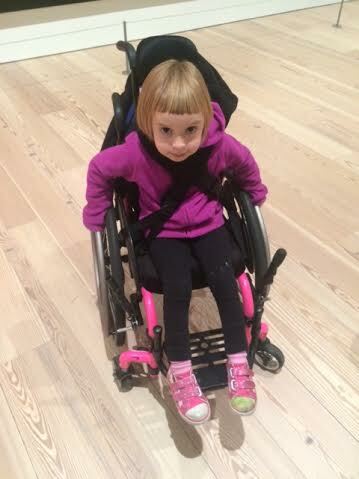 Her adaptive ballet class is putting her little troupe on the stage of Lincoln Center in two weeks. She swims weekly and has outside PT where she tumbles and stretches and zips on a zip-line. She has a pretty great life. 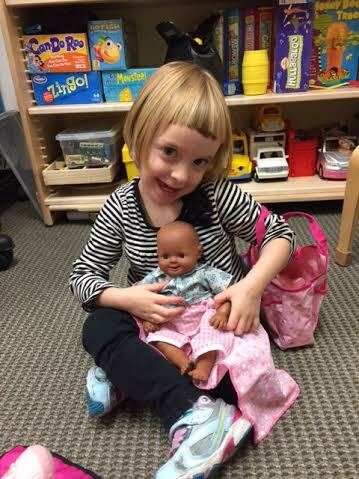 In addition to her PT, OT and speech sessions, she now gets play therapy twice a week. Originally the school didn't want to give this to her but I pushed and they ceded. And I'm so thrilled! 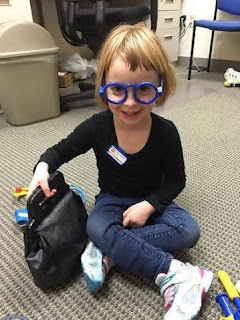 Ordinarily play therapy is for children with behavior issues but I argued that Teeny needs it since she has difficulty expressing her emotions. In speech sessions she works so hard on articulation, pronunciation and expressive vocabulary that there is little time for narration. So twice a week she meets with the school psychologist and they work through a whole host of emotions. They often play with dolls and doctor kits and other interactive games to encourage her imagination. When the short sessions draw to a close, the psychologist has to prepare her for ending and transitioning, which is difficult and sad for her because she likes the sessions so much. This is really, really good practice for her. The truth is that she seems to be going through a phase of getting easily frustrated. At four, it's totally age appropriate for her but it's also that she is mad at her body for not doing what she wants it to, at her mouth for not saying what she wants it to. And her frustration can be intense and hard to shake for all of us. There is a lot of pouting, arm crossing, huffing, even wailing. It would be easy for us to placate her with her iPad, with Laffy Taffy, with other things that make her instantly distracted. But we don't, because life isn't like that. And sometimes, when she struggles to soothe herself, we all suffer along with her. I am grateful for the play therapy because she gets to practice this in a controlled environment and we are learning how to help her through it at home. We stopped most of the Botox injections and her legs are getting stronger. She's using the rigidity and spasticity to help her stand, which she can do now with no hands for more than five seconds! We went through a very complicated process to have her approved for a mobility evaluation because with her new strength she needs a more lightweight walker. It took four months to get that appointment, but it's coming in two weeks and I can't wait. We have a wonderful physiatrist and an equally wonderful orthopedist who disagree fundamentally with each other about how to handle her legs, so when, a few months ago, she needed new braces and the ones that were made for her by the orthopedist's orthotist gave her painful sores on the insides of her ankles, we had to have them made again by the physiatrist's orthotist. As a result, she went for weeks without braces, which was terrible for her feet, and when we got them, she had to learn how to use them all over again, wearing them first for an hour a day, then two, then three. I have continued to wear her in a baby wrap long after most mamas stop wearing their babies. Because of her spasticity, I have to wear her with her legs closed, like she's riding side-saddle. She puts an arm around me and I put an arm under her legs and wear her like I'm sweeping her over a threshold. And I love every delicious moment. I can whisper with her, stroke her hair, breathe her in, feel her hugging me. But like her sister, Teeny is also getting taller, and she's getting heavy. This is problematic, because I can't carry her anymore. And her walker -- really a gait trainer -- is so heavy and clunky that she cannot use it independently for anything other than a physical therapy session. 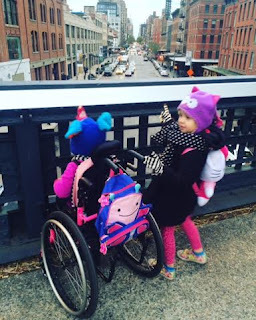 She can't use it to get herself down the street, or from one classroom to another. It's a big purple cage and it's hard for her to use. She hates it. We have no choice but to adapt to life with a wheelchair, and none of us wants to. She doesn't want to be independent and I don't want her to have to be. It's a tough place to be, but we have to go through it. She's going to grow into a big kid, and then an adult, and she's going to need this independence in kindergarten and in life. So the lessons continue, for all of us. All 4 of you make an awesome team. Great to read this. I guess Teeny needs all 8 of her wheels. She has choices. I don't blame her for hating her walker. At 4 kids watch EVERYTHING. That's harder to do when walking requires effort. I believe in the Teenster and miss all 4 of you! You have an abundance of love and for that you are fortunate. Thank you for the moving update, your cheerleaders are reading :). I've been wondering what you've been up to. I know too well that blogging silence often means tough times. Savor the sweet. It goes faster than you can imagine. Our kids are rockstars! You're being a great advocate. She's going to be fine even though it won't be easy. Hugs. Avoid fried meals mainly deep-fried as they incorporate a extremely good quantity of aussieassignmenthelp fats and even as fish and chicken seem leaner than red meat, this chicken can include more fats than when pork is fried.